Rogue Trooper is a science fiction strip in the British comic 2000 AD, created by Gerry Finley-Day and Dave Gibbons in 1981. It follows the adventures of Rogue, a "Genetic Infantryman", a genetically engineered, blue-skinned, super soldier and his three comrades' search for the Traitor General. His comrades are in the form of biochips – onto which a G.I. 's entire personality is downloaded at the time of death for later retrieval – and are named Gunnar (mounted on Rogue's rifle), Bagman (on his backpack) and Helm (on his helmet). He is genetically engineered to be immune to almost all known toxins, can submerge in strong acid unaffected, and is able to withstand a vacuum in his bare skin. 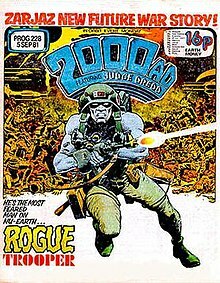 2000 AD #228, including the first appearance of Rogue Trooper. The series was rebooted in 1989 in the story "The War Machine," featuring a new version of the character called Friday. This version of the character last appeared in 1996. The original character returned in 1999 and all stories since then have featured the original Rogue. The character has also featured in a number of 2000 AD crossovers. Gibbons left the strip early on, to be replaced by a succession of artists and writers who have taken the strip in several different directions over the years. Artists to have drawn the character include Brett Ewins, Cam Kennedy and Colin Wilson. This quest continued from 1981 until 1985, when the G.I. had his final confrontation with the traitor general and, after a brief further run set on the Planet Horst, Finley-Day ceased writing the strip. Simon Geller took over, reinventing the character as an intergalactic hitman attempting to end the war by assassinating key figures, but this new direction was dropped in 1989. John Smith wrote a 'flashback' story, "Cinnabar", set in Rogue's deserter days, before original series artist Dave Gibbons returned to write a much more radical revamp of the character. In "The War Machine", Gibbons and artist Will Simpson created a different war, set on a different planet, starring a different Genetic Infantryman, this time called Friday. The bio-chips were dropped, and Gibbons concentrated on the politics and economics of war and the sinister nature of the genetic engineering involved. A new ongoing series featuring Friday followed, written by American writer Michael Fleisher. In Fleisher's final story, "Scavenger of Souls", the bio-chips are reintroduced via an alien 'soul collector'. Fleischer was replaced with Steve White, who made the military aspect of the strip more up-to-date and tried to reconcile the two versions of the character. He also reintroduced Venus Bluegenes (Helm's treacherous girlfriend from an earlier story who gained a more prominent role during the Simon Geller run) who had her own short spin-off run. His run on the character was also notable for the 2000 AD debut of artist Henry Flint. The character was rested after White's last story in 1996. In 1997 a related character, blue-skinned ambulance pilot Tor Cyan was introduced in the story Mercy Heights. In 2002 the original Rogue was reintroduced, again in flashback to his days hunting the traitor general, written by Gordon Rennie. Artists have included Staz Johnson, Dylan Teague, Mike Collins, Simon Coleby and PJ Holden. 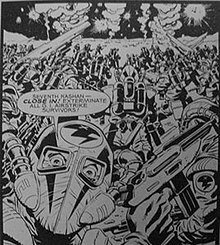 In 2004 Rennie stated that he had intended to revamp the character yet again, but had been blocked by 2000 AD editorial. He also hints that any return to the Rogue Trooper universe will concentrate on supporting cast and not include the Rogue character. This can be seen in the new series The 86ers. The story is initially set on the planet Nu-Earth, where a war of attrition between the Norts and Southers is being fought. There is some similarity to both the American Civil War and to World War I, with the Norts resembling Germany, and the Southers the Allied forces. During the conflict, many forms of chemical and biological weapons have been used, poisoning the planet's atmosphere and oceans. As a result, what remains of the population of the planet, including the troops of both sides, live in enclosed - "domed" - military bases and habitats. They wear protective suits, helmets and respiration gear when outside their domes. These suits are known as "chemsuits". Any damage to the helmet or chemsuit is usually fatal to the wearer, due to the toxic atmosphere of the planet. In an attempt to bring an end to the stalemate, The Southern High Command, over a period of years, have produced the GI - "Genetic Infantryman". The GI is a type of soldier genetically engineered to be immune to the poisonous atmosphere of Nu-Earth, and therefore be able to fight without the clumsy, inhibiting protective gear required by ordinary soldiers. The Southern High Command deploy the entire GI Regiment in a mass spaceborne capsule drop over an area of Nu Earth known as "The Quartz Zone", which resembles one of the Earth's Poles because the surface has an icy, glacier-like nature. The Quartz Zone assault was intended to be a surprise attack, but because a Traitor within the Southern High Command has passed details of it to the Norts, they are expecting the attack. The Norts employ elite infantry known as the Kashan and Kashar Legions to repulse the assault, and the entire GI Regiment - apart from Rogue - is wiped out. This event is referred to as "The Quartz Zone Massacre". Rogue, the only surviving G.I., goes AWOL in order to track down the Traitor General. Along the way he thwarts numerous Nort schemes, discovers and inadvertently destroys the only portion of Nu-Earth not contaminated by chemical weapons, and is betrayed by every female character he encounters. A later storyline – "MilliCom Memories" – shows how the GI's progress through their training, and that rather than a name each GI has a letter suffixed by their age. Rogue is "R", Gunnar "G", Helm "H" and Bagman "B". Two other troopers "D" and "N" are referenced in the storyline. During their training each GI is given a nickname - Gunnar is so named because of his marksmanship ability. Millicom Memories showed there were other prototype GIs before the development of Rogue's class, some of which were killed during his training. The series began with self-contained single episode stories, but later developed into multi-part story arcs. Rogue traveled around Nu-Earth attempting to track down and kill the Southern General - referred to as the "Traitor General" - responsible for the massacre of the GI Regiment. In a multi-part story titled "The Marauders", Rogue encounters a group of deserters from both Nort and Southern sides, who operate as scavengers from a hidden base and attack both Nort and Southers in order to obtain food, ammunition and supplies. Unknown to Rogue, the commander of The Marauders is the Traitor General he is seeking, but has been burned by a malfunctioning escape pod from the satellite he was stationed on and is unrecognisable. The General later reveals himself to Rogue, then captures and tortures him. Rogue eventually escapes, and with the help of one of the Marauders – a Souther pilot known as 'Player' – defeats the Marauders that pursue him. The Traitor General, however, escapes, destroying the Marauder base as he does so. In "All Hell on the Dix-I Front" a massive Nort assault forces the Southerners to retreat from a vast area of Nu-Earth, similar to the Ardennes assault of World War II. During this other Elite units of the Nort military are introduced, such as the Sun Legion, a Regiment of solar glider troops, and the Scum Marines, an amphibious assault force. "Sister Sledge", a military nurse accompanied Rogue during the Dix-I campaign, but is an enemy agent known as a "filth columnist" and dies in the final episode of the series when Bagman causes her to fall from a boat into the heavily polluted and toxic "Scum Sea". "Fort Neuro" introduced a defensive line that has been cut off from both Southers and Norts since the beginning of the war. The Fort has been split into separate sectors by the same clouds, meaning each sector operates independently of each other, without any contact or cohesion. The soldiers within each sector are suffering from posttraumatic stress disorder so the French sector – known as "Franks" – wear Napoleonic era uniforms, and hold grand balls that were popular in that period. Other sectors display similar erratic behaviour, with the English troops – known as "Lime-ees" – dressing as holiday camp redcoats and behaving as though they are on a perpetual holiday, while the "Rom" garrison fashion themselves as 1950's Teddy Boys - or "Romeos". A new plant is discovered after permafrost is melted in an arctic zone, which renders him unconscious. In the flashback story "Cinnabar" a retrovirus is engineered specifically to target his immune system, making him susceptible to all other Nu-Earth hazards, ultimately forcing him to wear a chem-suit. On Horst, Rogue is bitten by one of the Dragoid creatures causing him to pass out. As Bagman points out - Rogue was engineered to be resistant to conditions on Nu Earth, not those unique to Horst. However, the toxin quickly wears off, and in fact has a beneficial effect on Rogue. In a lighter moment during the Fort Neuro series, Rogue is shown to have difficulty breathing when in a staff car full of officers from the "Rom" sector, who in anticipation of a good night out with the neighbouring "Scan" sector, have applied too much aftershave. The Biochips are infected by a latent malady unknowingly contracted whilst passing through the Neverglades area of Nu Earth. The unnamed condition renders them susceptible to "Enzyme E disfunction", which causes their newly re-gened bodies to disintegrate, leaving only their bio-chips remaining. Most Nort protective suits show only the eyes, and the Southers generally have see-through face panels. "Nort" redirects here. For "zero, nothing", see nought. Norts are a fictional fascist enemy with Slavic and Germanic overtones. They are fighting the Southers. They were mainly responsible for the Quartz Massacre. The Traitor General was briefly allied with them. In a war which broke out on Earth, it is presumed that Germany and Russia formed a large empire stretching from Asia to Central Europe and ended the war by entering into an unstable alliance with the Southers. The ruling political party of the Norts, the Nordland Party, urged their armies to colonise the various planets deep in Souther space, including Nu-Earth. The early Nort colonists lived in the desert and tamed its wild animals. Years later, when it was discovered that the black hole near the planet led to other parts of the Galaxy, the Norts declared war and launched a preemptive attack on Fort Neuropa, starting the "Nu-Earth Future war". By the time of Rogue Trooper, the atmosphere of Nu-Earth is heavily poisoned by war gases and cannot be breathed except by the Rogue Trooper; all others in the open must wear chemsuits. In the separate 'Friday' continuity, the Norts started off as a trading company and rival to its sister company, the Southers (both owned by the Clavel Corporation, a megacorporation). When their parent company started a war between Humanity in an effort to avoid stagnation, they pitted the two corporations against one another. After several years (during which time, they started the Eugenics Project), they recalled all high-ranking officers back to their corporate HQ. The sole surviving member of the program, Friday, sneaked on board a rocket bound for their corporate HQ and successfully assassinated Mr. Clavel, the founder and CEO of Clavel Corporation and destroying the company AI, Highside. In the process, he re-ignited the war between the two trading companies. In the "Realpolitik" storyline, War Marshal Zell travels to Nu-Earth after hearing of his son's death. 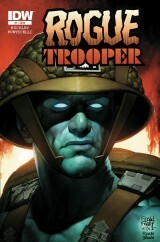 He releases Kapitan Arkhan from prison with the intention of capturing and killing his son's killer, the Rogue Trooper. When Arkhan fails the mission, Zell orders Nu-Earth to be captured and sends all available troops there. Eventually, Zell's Inner Circle begin to plot against him, believing he has gone mad due to his son's death. They capture Rogue Trooper and order him to assassinate Zell. Arkhan discovers the plot and executes the chief plotters. Meanwhile, Rogue's contact in the base (who is a Double agent) betrays him, resulting in her death. Arkhan then contacts Rogue and orders him to continue the mission. After Rogue successfully finishes the mission, he is captured, but is soon released by Arkhan after Arkhan is promoted to War Marshal. Before the newly promoted marshal leaves Nu-Earth, he orders the remnants of the plotters to be executed. Stammels, descendants of Earth Camels which can breathe the chemically contaminated air of Nu-Earth, ridden by Nort Desert raiders. The Office of the Public Truth- A unit that hunts war criminals, as featured in the Jaegir spinoff comic series. The Office of Genetic Purity- Another internal security unit with a particular focus on hunting those Nort soldiers infected by the Strigoi Curse. Again featured in Jaegir. Their usual chemsuit has a soft hood, often with a low blunt-pointed top, hiding the wearer's face completely except small round or oblong eye-holes, and two large backpack air or oxygen cylinders. Two wide breathing tubes run, one from the top of each cylinder over the shoulders and run into the hood beside his mouth and nose. The design was likely inspired by the old-type open-circuit aqualung. In some episodes this set has an extra smaller cylinder on the back of the two main cylinders, likely imitated from U.S.Army flamethrowers. In at least one comic issue, one page (page 7) shows Nort chemsuit breathing sets drawn with the breathing tubes coming from an (undersized) demand valve midway between the tops of the cylinders; but many other Nort breathing sets in that issue show the usual design, and in a few frames a version with one cylinder. Morgen - Ex-Nort sniper for the "Marauders"
Mr. Brass of Bland & Brass bodylooters. Sister Sledge - Filth Columnist who worked in Nu-Atlanta and nearly captured Rogue during the Norts' DIX-I offensive. The Norts were inspired by the Northerner Unionists from the American Civil War and the Nazis from World War II. The Norts' protective suits (showing only the eyes) reinforce the "Bad Guy" delineation. They often say "Stak!" when either surprised or dismayed. They often say "Nain", as a substitute for the word "No", this sounds and looks similar to the German spelling of the word "Nein". The Nort lightning-bolt insignia bears some similarity to the insignia of the British Union of Fascists under Oswald Mosley. "Southers" redirects here. For other uses, see Souther (disambiguation). Southers are the "good guys" fighting the Norts in Rogue Trooper. Their country is called the Souther Confederacy. They receive orders from Milli-com, their military command complex. It was Souther army scientists who developed the G.I.s in an attempt to produce a soldier more suited to the toxic conditions on Nu-Earth. After an unnamed war ended on Earth, the remnants of America and Britain quickly took control of the Americas, Western Europe and parts of Africa to create a new country and proceeded to promote peace and stability on Earth. They then proceeded to colonise other planets, forming the "Souther Confederacy" and when Nu-Earth was discovered, they built Fort Neuropa as a base of operations. When it was discovered that the black hole near the planet led to other parts of the Galaxy, tensions mounted between both sides. Eventually, the Norts attacked Fort Neuropa so the Southers were forced to retaliate. By the time of Rogue Trooper, Souther Gene-Scientists had created the G.I. Project in a desperate struggle to win the Nu-Earth Future War. In the separate 'Friday' continuity, the Southers started off as a trading company and rival to its sister company, the Norts (both owned by the Clavel Corporation, a Mega Corp). When their parent company started a war between Humanity in an effort to avoid stagnation, they pitted the two corporations against one another. After several years (during which time, they started the Eugenics Project), they recalled all high-ranking officers back to their corporate HQ. When the sole surviving member of their eugenics program, Friday, sneaked on board a rocket bound for their corporate HQ and successfully assassinated Mr. Clavel, the founder and CEO of Clavel Corporation and destroying the company AI, Highside, in the process, he re-ignited the war between the two trading companies. Fort Neuropa was a Souther fort in the "Fort Neuro" story in the Rogue Trooper stories. Completely isolated since the beginning of the war, its garrison developed bizarre customs (as a result of watching old historical movies and neglecting their Robe-Runners) resulting in its inhabitants aping the manners and clothes of various European nations and groups from centuries earlier. When Rogue Trooper arrived at "Fort Neuropa", he discovered that everyone was suffering "Siege Mentality". After losing Bagman, Helm and Gunnar to the "Fort Neuropans", he discovered a plot by the Norts to capture the fort by playing on these neuroses. After foiling an assassination attempt on his life, he recruited the Robe-Runners to help him foil the invasion. Afterwards the neuroses cleared and the garrison were all back to being ordinary Southers. Frank sector: Here the garrison had developed a Napoleonic-period French mentality and were trying to talk in French (spelt phonetically, e.g. "Kee valla?" for "Qui va là?" = "Who goes there?"). A Nort had played on this by impersonating Napoleon Bonaparte. Rogue, with help from the Robe-Runners stopped this invasion while Gunnar killed the fake emperor. Lim-Ee sector (Camp Reveille): Here the garrison had developed a holiday camp format. Their self-styled elite, who had taken on a personality similar to stereotypical English hunt parties, quickly wiped out the Norts. Rom Sector: Here the garrison had developed a disco format hence "Rom" meant Romeo. Norts were using Dreamweavers and their own women. Scan Sector: Here "Scan" stood for "Scandinavian". The Scan sector was predominantly garrisoned by women, mostly falling into the blonde bombshell stereotype. As a result, they had close links with the Rom sector, and the two garrisons defended their sectors together. Admiral Torpitz then used his Scum Legions to attack all four sectors at once, bringing in their "Amoks". All the sectors attacked the Nort forces destroying all the Amoks and killing the majority of the Norts which resulted in the rest of the Norts surrendering. During the battle, the resulting explosions and force-fields make a break in the chem-clouds which resulted in sunlight reaching the ground and as a result, the garrison lose their format obsessions. Before Rogue leaves, the Fort Neuropans reward the Robe-Runners with a new redesign and vow to protect Fort Neuropa from the Norts. As a result, the Nort commander in charge, General Vagner went insane from the shock of defeat. Shortly afterwards, Fort Neuropa was destroyed. Its remnants reverted to the World War II era with the leaders modelling themselves after Winston Churchill, Josef Stalin, and Harry S. Truman. Their usual chemsuit has a hard helmet, often with a big anti-gas filter like in gasmasks but bigger, on the front of the chest, connected by a wide breathing tube to the bottom of the helmet faceplate. All the wearer's face can be seen from outside. Mr. Bland of Bland & Brass bodylooters. Major Magnam - A GI Officer whose bio-chip was found in a weapons auction implanted into a GI Officer's side arm. The Southers were inspired by the Southern Confederates from the American Civil War (including the rebel yell of "South Side, yeah!") and the Allies from World War II. Their protective suits (showing their faces) reinforce the "Good Guy" delineation. Many elements of the Rogue back-story were inspired by World War II, the American Civil War and the Cold War. Norts (Northerner Unionists) fought against generally less-well equipped Southers (Southern Confederates), and several battles were referenced, such as the First Battle of Bull Run, which was retold as the Battle of Mek-Bull Run. The Norts appear totalitarian in nature. While their uniforms have Nazi connotations their dialect and names are mostly quasi-Slavic, as if they represented a futuristic version of the Soviet Bloc, although there is some usage of Germanic names as well, for example General Vagner, Admiral Torpitz. Their conduct and methods of waging war are also more barbaric than those of the comparatively civilised Southers. Although as the series develops the Southers are also shown committing comparably immoral acts as well. "Genetic Infantryman" is a direct homage to the supposed "Government Issue" tag that American troops were nicknamed after. The Rogue Trooper has appeared frequently in comics and other media. The Hitman storyline concluded in the 2000 AD Winter Special 1989 (see below). The initial reprints of the 2000AD stories were printed by Titan Books. The most recent books are printed by Rebellion Developments. Starting in February 2018, Rogue Trooper began to be collected in 2000 AD: The Ultimate Collection. The 86ers was created by writer Gordon Rennie and drawn by artists Karl Richardson and PJ Holden. The story stars G.I. pilot Rafella "Rafe" Blue and her robot Gabe. Venus Bluegenes appeared both in Rogue Trooper and in her own eponymous strip, with stories written by authors including Grant Morrison, Steve White and Dan Abnett. Tor Cyan appeared both in Mercy Heights and in his own eponymous strip, in a series written by John Tomlinson. Jaegir is a recurring series in 2000 AD, focusing on Kapitan-Inspector Atalia Jaegir, who serves in the Nordland State Security Police. Her role is to hunt down escaped war criminals. Gordon Rennie and artist PJ Holden produced Hunted, a story told from the point of view of the Traitor General, in 2016. It began in prog 2001, and a second series ran in 2017. IDW Publishing's Rogue Trooper #1. On 20 July 2013, American company IDW Publishing announced that after the success of its adaptation of Judge Dredd from 2000 AD it would now champion Rogue Trooper with recoloured old issues as well as completely new stories. "Following the success of Judge Dredd, IDW and Rebellion/2000 AD expand their thriving relationship with the addition of Rogue Trooper to their publishing slate! IDW will launch an all-new Rogue Trooper series in 2014, and also offer newly colored re-presentations of past Rogue Trooper comics, too." On 13 November 2013 it was announced that the new series would be written by British fantasy writer Brian Ruckley and drawn by Alberto Ponticelli. Brian Ruckley acquired the position "by writing a pitch document that people apparently liked." He described his first challenge as scriptwriter as "I can now say from personal experience that writing comics is not straightforward or effortless!" IDW also published Rogue Trooper Classics, a series of recoloured stories from 2000 AD, in order. It was originally intended to consist of 12 issues (with issue 1 being published on 14 May 2014), but like the new Rogue title, it was cut short, with only 8 issues to be produced in total - again, a result of lower-than-expected sales. The Rogue Trooper Boardgame was released in 1987 by Games Workshop. A number of Rogue Trooper computer games have been released in 1986 and 1990. An isometric shooter by Piranha Software for the Amstrad CPC, Commodore 64 and ZX Spectrum was released in 1986. The game consists of killing Norts while searching Nu-Earth for 8 vid-tapes containing evidence of the Traitor General's involvement in the Quartz Zone Massacre, where all of the G.I.s except Rogue were slaughtered. On finding all 8 tapes, Rogue has to return to the Souther base of Milli-Com to prove the General's treachery and the extenuating circumstances of his going AWOL. During the game, as well as the vid-tapes, players could also pick up medi-kits to regain health and ammo boxes to feed Gunnar. A platform game incorporating first-person vehicle levels for the Amiga and Atari ST by Krisalis Software came out in 1990. After Rebellion bought 2000 AD they released a Rogue Trooper video game in 2006, with a Wii version out in 2009. In 2009 Rogue Trooper featured a guest role in the game "LittleBigPlanet" for PS3. It came in the form of content which could be bought in the PlayStation Store. In 2017 Rogue Trooper Redux is coming to the current generation PC, PS4, XB1 and Nintendo Switch, developed by Rebellion and TickTock Games. Grant Morrison has said he will be writing a Rogue Trooper screenplay for Sam Worthington's production company Full Clip Production. On July 16, 2018, Duncan Jones revealed that he will direct the movie, without Full Clip Production. In 2018, a not for profit short fan film directed by Adam Kirley, produced by Joby Stephens and starring stuntman Damien Walters is being released. The short will premiere at the International London Sci Fi film festival. In November 2018, Rebellion Developments will set up a studio for Film and TV series based on 2000 AD characters with Rogue Trooper as one of their project. ^ Armitage, Hugh (12 March 2014). "2000 AD teases Rogue Trooper spinoff Jaegir from Rennie, Coleby - Comics News". Digital Spy. Retrieved 9 March 2015. ^ "Brian Ruckley Suits Up, Ships Out With "Rogue Trooper"". Comic Book Resources. Retrieved 9 March 2015. ^ "Brian Ruckley · Rogue Trooper". Brianruckley.com. Retrieved 9 March 2015. ^ "IDW Publishing Products Shipping In February 2014". PreviewsWorld.com. Maryland, USA: Diamond Comic Distributors. 2014. Archived from the original on 31 March 2014. Retrieved 28 February 2014. ^ Rich Johnston (25 March 2014). "Rogue Trooper On Hold At IDW, Full Speed Ahead At 2000AD". Bleeding Cool. Archived from the original on 9 September 2014. Retrieved 8 September 2014. ^ "Rogue Trooper: Last Man Standing". IDW Publishing. Retrieved 9 March 2015. ^ Denton J. Tipton (editor) [@dentontipton] (8 September 2014). "Eight issues now, due to sales" (Tweet). Retrieved 8 September 2014 – via Twitter. ^ Lyons, Beverley (3 October 2011). "Monster Success: Top comic writer Grant Morrison set to turn his novel Dinosaurs vs Aliens into a movie". Daily Record. Retrieved 3 October 2011. Indeed, after he's put the finishing touches to the Dinosaurs vs Aliens script, a prolific Grant is creating a movie adaptation for Sam Worthington's company. Called Rogue Trooper, the project is based on a character from the popular British comic book series 2000AD. ^ McMillan, Graeme (15 July 2018). "Duncan Jones Teases 'Rogue Trooper' Movie". The Hollywood Reporter. Retrieved 16 July 2018.